The recent death of the great and underrated actress Jean Simmons got me to thinking about the movie Elmer Gantry in which Simmons portrayed the evangelist Sister Sharon Falconer. Simmons, though British, brought this quintessentially American character to vivid life in a way the original novel’s author, Sinclair Lewis, couldn’t have ever imagined. The 1960 movie, which starred Burt Lancaster as the slimy and duplicitous preacher Elmer Gantry is spectacular, but one of the reasons it, and the original novel, should be of interest to the OTRCAT fans is its reliance and wonderfully detailed involvement of radio. 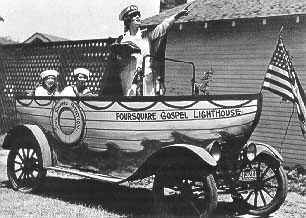 Religion on the radio is nothing new; in fact it had its roots early on in that laboratory of programming Pittsburgh’s KDKA when, on a Sunday morning in January of 1921 they put a microphone in a local church and broadcast the morning’s services. 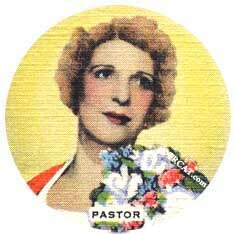 The legion of preachers who took to the airwaves is long, varied, dynamic and oh so colorful, but chief among those radio rabble rousers of religion was the Canadian born evangelist Aimee Semple McPherson who was the real-life the model for Sinclair Lewis’ Sister Sharon. McPherson, was born on October 9, 1890; her original name was Aimee Elizabeth Kennedy. Though her religious parents dedicated her life to God, as a teenager she had difficulty reconciling the scriptures with the innovative and controversial science of people like Darwin, and so, rejecting her parents, she became an avid atheist who publicly debated her beliefs.That devotion to atheism lasted until she heard the preacher Robert Semple under whose spell she fell; she became a devout follower and also, Mrs. Semple.Within months Aimee was preaching to large crowds, including an overflow gathering of more than 15,000 people in London. Unfortunately, Robert, while on a mission in China, died less than a year later.Pregnant, Aimee moved to New York where her mother was working for the Salvation Army.In New York she married Harold McPherson, but domestic bliss wasn’t her thing, and she claimed God was calling her to spread the word.She bought a used car and drove coast to coast with handmade billboards attached to the vehicle; on one side JESUS IS COMING—GET READY; on the other WHERE WILL YOU SPEND ETERNITY? Stopping along the way, she preached to overflow crowds in her canvas cathedral. PLEASE ORDER YOUR MINIONS OF SATAN TO LEAVE MY STATION ALONE. YOU CANNOT EXPECT THE ALMIGHTY TO ABIDE YOUR WAVELENGTH NONSENSE. WHEN I OFFER MY PRAYERS TO HIM I MUST FIT INTO HIS WAVELENGTH RECEPTION. OPEN THIS STATION AT ONCE. 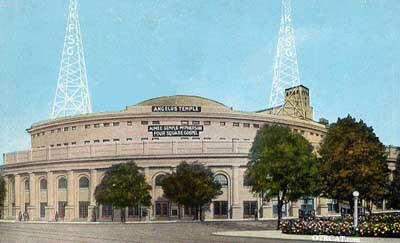 The story of Aimee Semple McPherson is one that is hard to believe, but impossible to have made up. There are gaping holes and personal mysteries, but what we do know is that she was an amazing orator who delivered a distinct message to a huge and powerful audience. 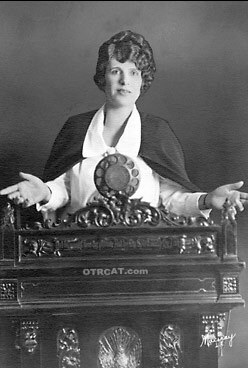 This new Aimee Semple McPherson collection from OTRCAT.COM really gives today’s more sophisticated audiences a clear understanding of how she did what she did. Long before the far more insidious Father Coughlin manipulated his audience, McPherson entertained hers, bringing them with her, like a pied-piper of the airwaves. Open your ears to the amazing way she used her voice and told stories to her audience. She was a colorful character indeed, but from a radio standpoint she was an innovative, forward looking radio pioneer and this new collection will thrill, and in some ways, even terrify old radio fans. 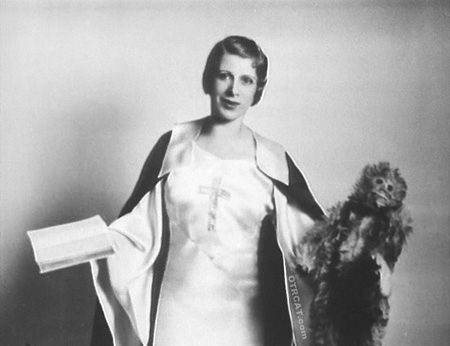 For more on Aimee Semple McPherson, read Anthony Rudel's HELLO, EVERYBODY! THE DAWN OF AMERICAN RADIO. Spoiler : She is truly part of our American History. I was born in 1944 in Chicago and later heard of her.